I've been exploring paper flower craft in the last number of months. Halloween season has inspired me create some paper Audrey IIs. 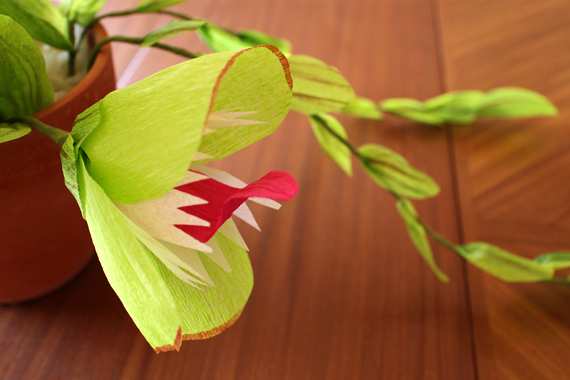 As a reminder Audrey II was the flesh/blood eating plant from Little Shop of Horrors. Please note; if I go missing in the near future it's most likely I've been eaten by my own craft project. For my table display I've paired the pot of Audreys with some of my weirder and pricklier looking succulents. 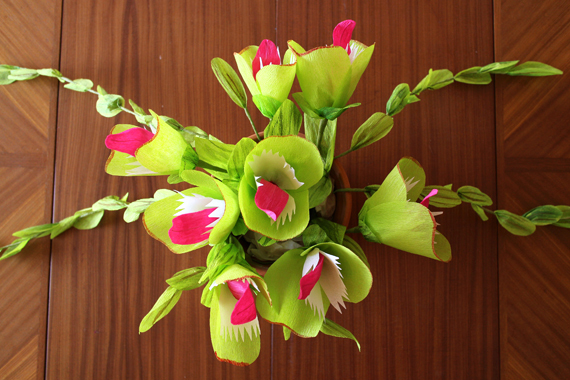 Check out my Halloween pin board to see more creepy plants and ideas for eery plant craft. Posted in Pretty trimmings/decor, Paper flowers and tagged with Audrey 2, Little shop of horrors, paper flowers, feed me seymour, homemade halloween, green, tongues, paper plant, creepy plants, crepe paper, watercolor, handmade halloween. October 23, 2013 by Shasta Garcia.